/GOODBYE UGLY – HELLO BEAUTIFUL! STYLISH CAMERA BAGS THAT FIT YOUR LIFE. Let’s be real here – those ugly stock camera bags may be functional but they are a million miles away from being fashionable. As women on the go we have to make sure both function and style are represented. These stylish camera bags work great for the photographer, momtographer, or mom on the go as they are not only super cute but built to last. All of them are customizable to suit your needs and your life. 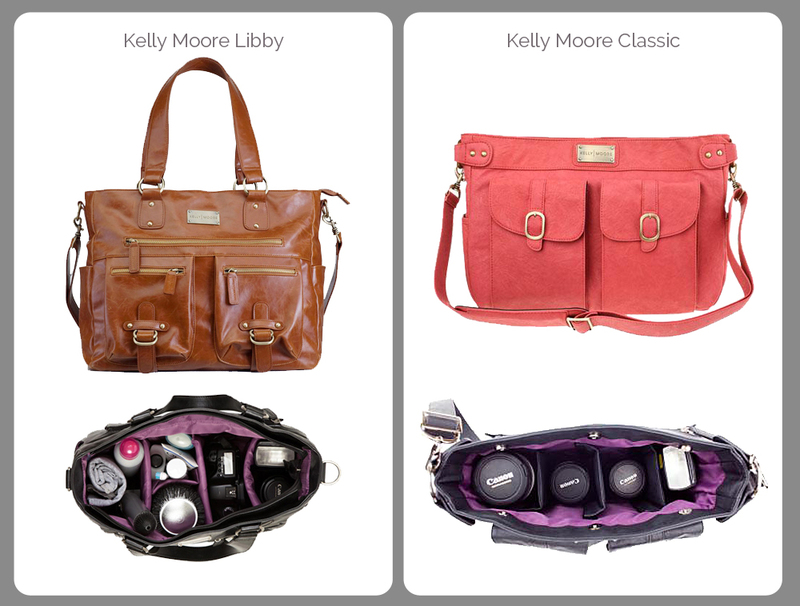 Kelly Moore Bags I LOVE Kelly Moore Bags. You don’t even know. I own 2 of them – the Libby Bag in caramel ($249) and the Classic in coral (no longer available). Both of these bags are great, but the Libby is my go-to bag for basically everything. Chances are if you see me shooting I probably have my Libby with me. It not only holds a camera body with attached lens, but it will also hold up to a 17” laptop. Plus with the fully customizable velcro pads it keeps my things safe and organized. Best of all this bag isn’t overly feminine so if I get really tired of lugging it around my male assistants don’t feel ridiculous wearing it. Both the Libby and the Classic are very well made and have held up to years of use – and trust me when I tell you I beat them up. Kelly Moore currently has 15 different style bags in an array of colors so there is guaranteed to be one to suit your needs and your personality. Epiphanie Bags Epiphanie Bags are fabulous. 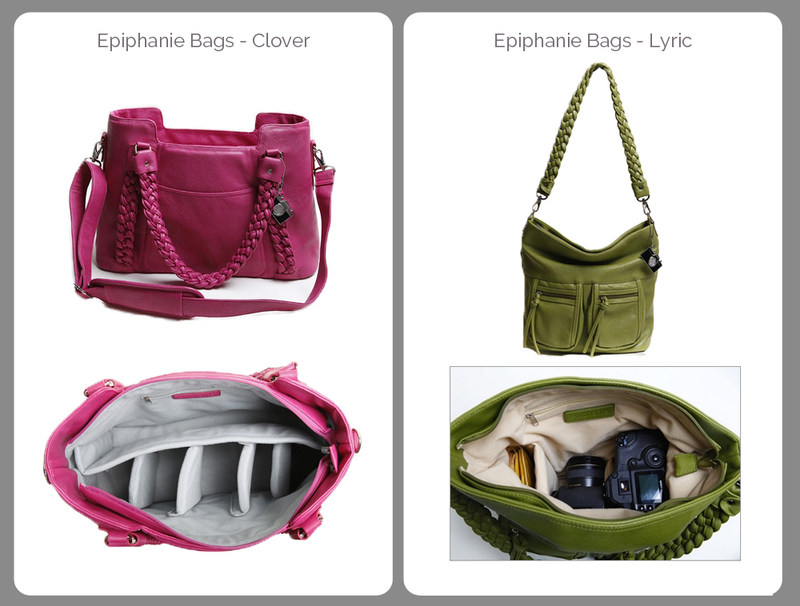 My two favorites are the Lyric in olive ($155) and the Clover in fuchsia ($185). Epiphanie Bags combine function and fashion to create bags that are exactly what you’re looking for. These bags are designed to accommodate your iPad or 15″ laptop, camera + attached lens, 2-3 extra lenses, flash, battery pack, wallet, keys, cell phone, memory cards and more! Moms – pack your camera, diapers, wipes and snacks in these bags and you’re ready for a day out with the kids! Theit Theit only has a handful of different styles, but the styles they do have will definitely satisfy your hunger for adorable and functional bags. 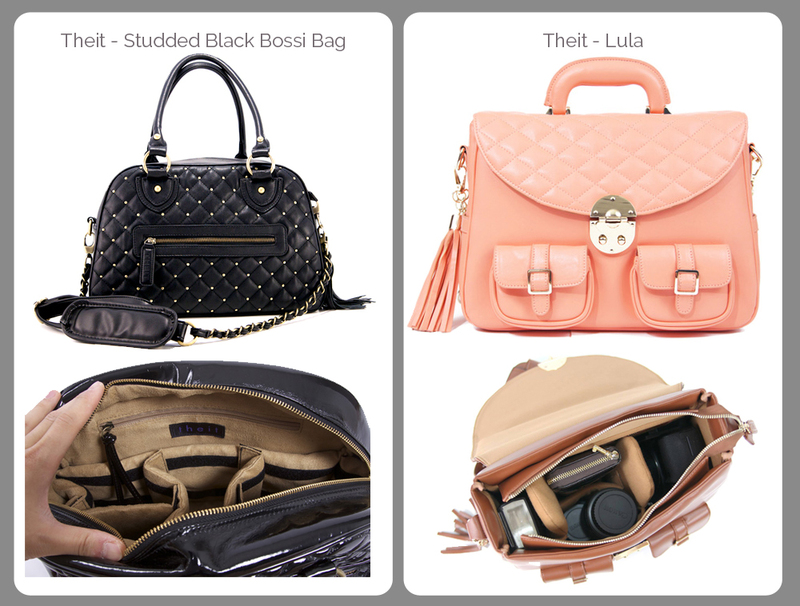 My favorite is the Studded Bossi Bag in black ($199) followed by the Lula in coral ($219). All of Theit’s bags are sleek and professional looking. Perfect for the street fashion photog or blogger on the go. Jo Totes offers many cute bag options. Overall Jo Totes are a bit more affordable then some of the other options with most of their bags being $100 or less. 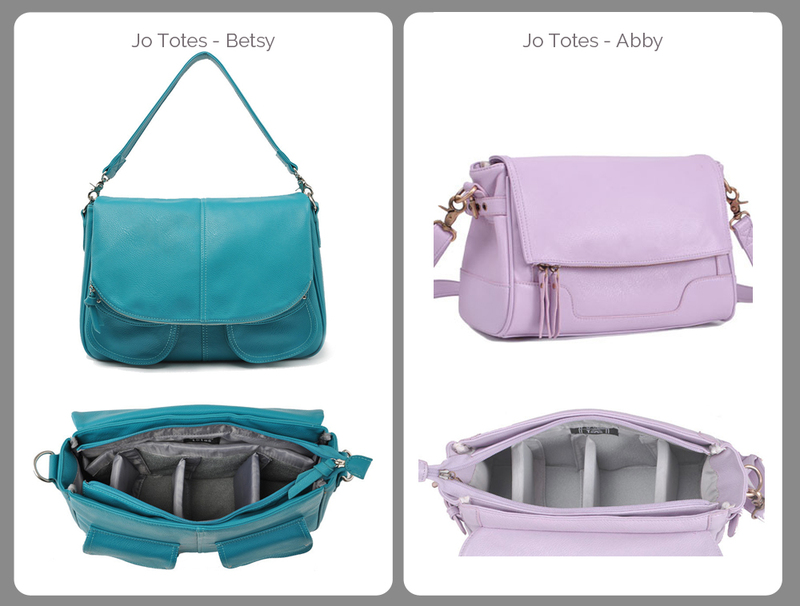 My 2 favorites are the Betsy in teal ($109) and the Abby in lilac ($89). Both bags are classic, fresh, and the perfect companion for travel, a photo shoot, or everyday wear. These bags are gorgeous! I mean seriously luxurious – but you will pay for that luxury since these bags are by far the priciest of the bunch. They are made with genuine italian leather and they are damn nice if you have the money for them. I personally don’t trust myself with one but that’s because – like I said before – i tend to beat my stuff up and as nice as genuine leather is its one more thing I have to worry about maintaining. If I ever was to splurge on an Ona bag it would definitely be between the Capri in cognac ($349) or the Chelsea in cognac ($369). 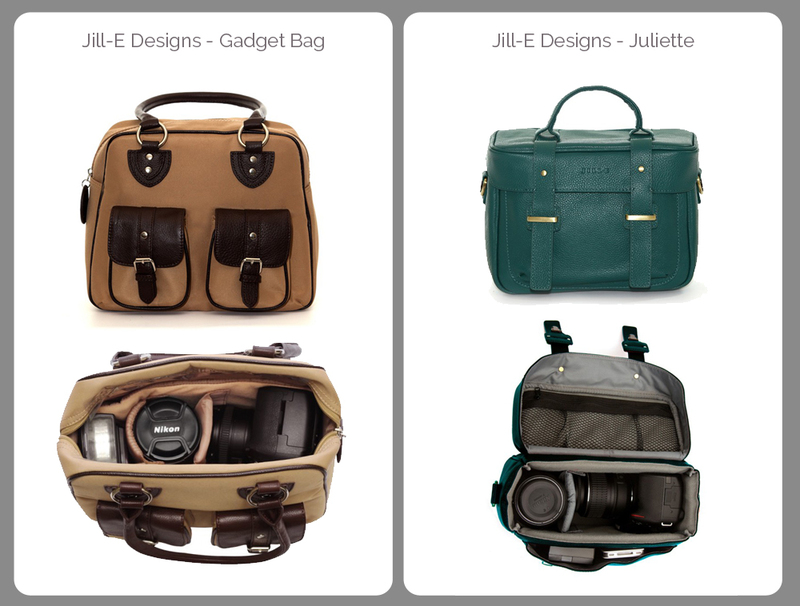 Jill-E bags are well made, but definitely on the smaller side, so they just don’t fit with me and the way I shoot. However, they may be just what you’re looking for though if you want something really compact. The largest one they have is the Gadget Bag in nougat ($75) but if you want something really compact I’d look at the Juliette in teal ($170.00). These bags are so fun and are really well crafted out of genuine leather. There are a ton of color options so if you really want something with a pop of color definitely check them out. 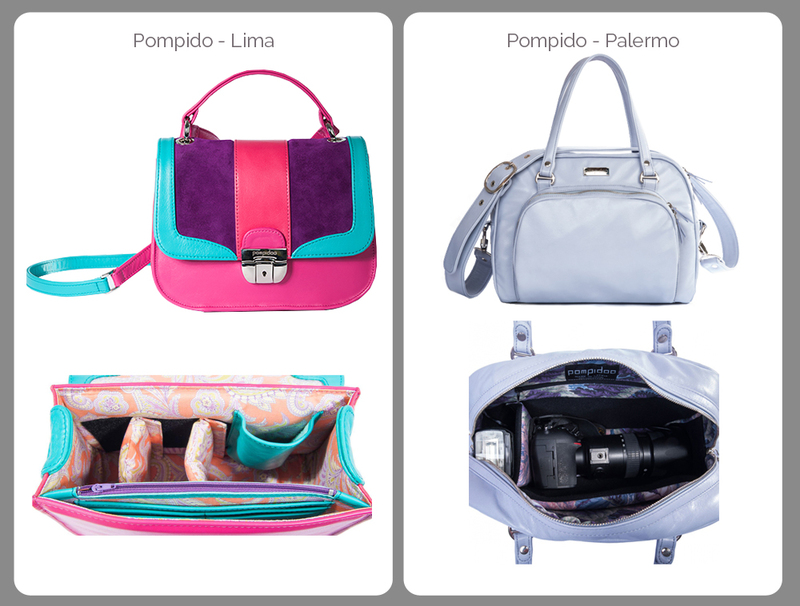 One of my favorite things about Pompido bags are their super fun and vibrant interiors. Not only are they super cute prints, but since they are light it’s very easy to find what you need. My favorites are the Lima – really in any of the colors but especially the pink/purple/teal combo ($220) or the Palermo in sky ($336). 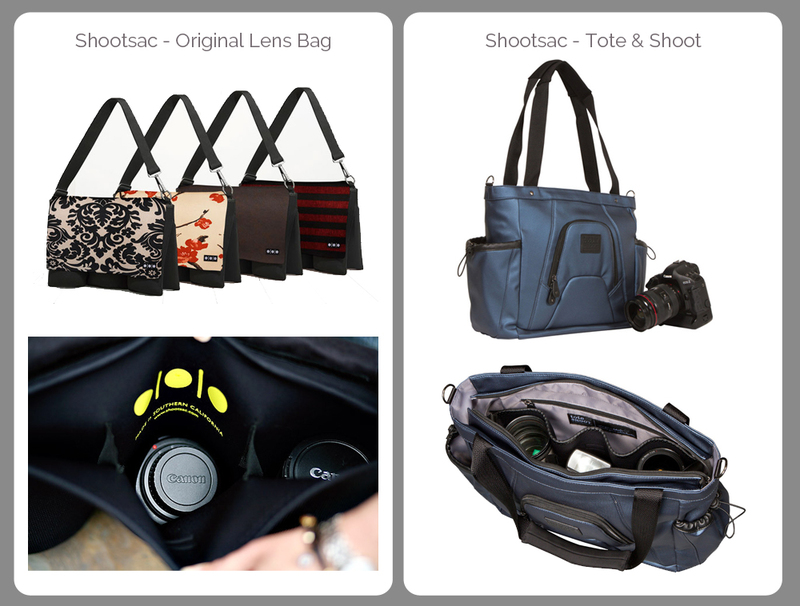 The original Shootsac Lens Bag ($179) was primarily designed to wear while you shoot to be able to hold your lens for easy swapping on the go. There are a ton of cute covers you can get for these or you can even make your own covers which is pretty cool. Since then, Shootsac has released the Tote and Shoot ($230) which is more of a cross over between shooting and all-around carrying bag and it has a great side loading camera pocket. Shootsac is nice because they are very functional – having said that though, they are in my opinion, the least stylish of the group. 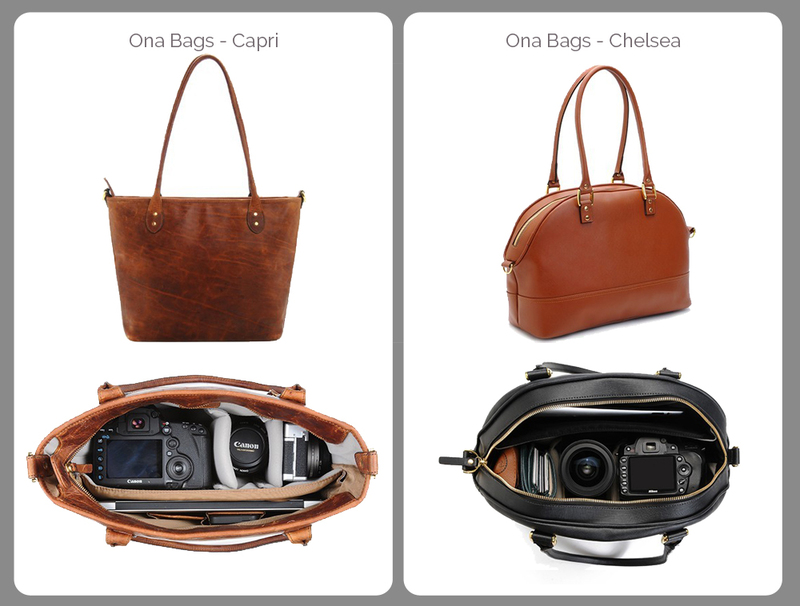 Let us know what you think – Which of these stylish camera bags are your favorite? Did we leave any brands you love off the list? Leave your comment below.